We are a small, friendly, sociable hostel located on a quiet street in the heart of Belgrade, next to the Republic Square and the cities other main areas - Knez Mihailova pedestrian zone, Kalemegdan fortress and Skadarlija bohemian quarter. The hostel has recently been renovated and all of our facilities are new and in excellent condition. 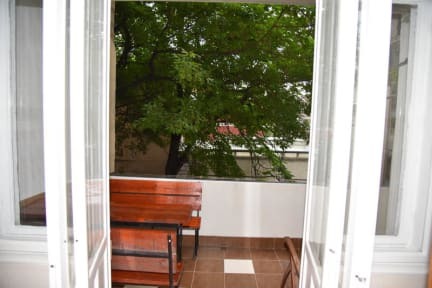 We have a nice balcony where we like to hang out together and drink coffee, rakija, and eat good food. The neighborhood is relaxed with many cosy cafés, bakeries, bars, and restaurants at our doorstep, with the major nightlife areas being a few minutes walk away. We offer you clean and quiet place to stay, clean sheets, free towels, hot shower all day, common room, spacious security lockers, deposit safe box etc. Our staff is fluent in English and helpful with touristic info. Hostel is open 24/7, no curfew. 10 Euro deposit for keys. 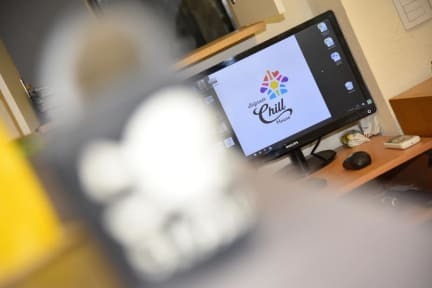 Très bonne expérience au chill house. L'auberge est très propre la literie est neuve et les gérants sont très accueillants (j'espère que vous aurez la chance d'avoir le goulache special Geronimo) . Facile d'accès depuis l'aéroport ou la gare et bien situé pour les excursions dans le centre. Je recommande vivement !!! Nice and clean place. The rooms are ok. Nice kitchen and common room. Located in the center. I definitely recommend this place mainly for the crasy duo of James and Srdjan. Really nice people. Probably the best hostel in Belgrade. A lot of fun and perfectly located in the very centre of Belgrade, just some steps from Kalemegdan fortress on one side and Skadarska street on the other side. The personnality of the owner, makes it such a unique experience to stay at Chill House. He is always helpful, making feel you as a member of the family and one night he cooked for us ! Apart from that, beds were good and comfy, bathroom and rooms very clean. The best part of this hostel is Srdjan, our host. He took care of us like we were family. The hostel feels like home and the emplacement is truly in the center, you coudn't have a better emplacement. The Best hostel of my trip! Perfect location, perfect host, amazing staying here in Belgrade ! The place to be! It is one of the best hostels I've ever stayed at! First of all, the hostel if perfectly located in central Belgrade, closed to the monuments, nightlife, and also one step from the bohemian neighbourhood of Skadarska. The staff was really friendly and helpful. The room, bathroom and shared commodities were perfectly clean. Next time i'm in Belgrade I will definitely come back to Chill House!